The biggest question asked of children, from toddlers to teenagers, “What do you want to be when you grow up?” It’s always asked with the best intentions, to get kids to think of their future. Or at least, to give parents some idea of what field to push them towards. After all, how many children really know what they want to do with the rest of their lives? Oh yeah, there are those lucky few who have a special calling. They know exactly what they want from the start and go for it- Aurien Uriah wasn’t one of them. Aurien’s parents had enrolled him in school just after his fourth birthday which was rather early, too early as far as Aurien was concerned. Most of the kids in his class were at least two years older than him and had resented Aurien from the start. Aurien assumed it had something to do with his parent’s money or position on Cularin as the Zoologists and new owners of the “Bollin Exotic Animal Emporium”, but being part of the only Keshiri family on Cularin didn’t help his situation either. One summer day Aurien was pacing back and forth inside the Uvak enclosure, the small violet skinned boy seemed quite out of place among the massive, winged Reptavians. He was still contemplating his first assignment: “What do I want to be when I grow up?” he asked himself over and over until he marched directly into one of the giant birds. As Aurien fell to his rear, he heard a distant scream and saw two cloaked men running toward him. Aurien felt a bolt of fear just as one of the Uvak jumped over his head, toward the two advancing men. He rushed to his feet and started sprinting after the bird as fast as he could but fell after a few steps and hit his head, turning his world black. Aurien awoke to the familiar concerned faces of his parents in his bed and the two cloaked men, smiling behind them. Coruscant agreed with Aurien. The City was busy and fast paced, not at all like the small cities in Cularin. Everyone here was moving toward a purpose, not just standing around making small talk with each other or just “Shooting, the breeze”. He especially grew fond of the Jedi temple, massive and filled with other children of all ages, shapes, and sizes. He would not stand out among them like his last school. For the first time since he could remember, Aurien was filled with Joy. Despite the diversity of the temple, Aurien was most often seen conversing with two men. The first was a pale man named Alad Creed and the second was his soon to be Mentor, a Zeltron Knight named Zuza Truba. Master Truba was a gentle man with light red skin and white hair and a permanent smile plastered between his sharp features. When Aurien and Truba were first paired together, Truba took Aurien’s training saber and locked it away, never explaining why. This puzzled Aurien, but despite his silent protests, Truba never so much as grazed the subject again. In the years that followed Truba taught Aurien many different Force techniques and theories, but focused on one idea in particular: “The Living Force”. Truba was considered to be a bit of an unorthodox teacher by his peers, preferring to practice spars with Force abilities such as Telekinesis and Telepathy rather than with a Lightsaber like traditional spars. Even outside of the Dojo, Aurien seemed to always be training some technique or another. During the war, in Aurien’s teen years, Truba was no longer able to stay neutral. He was sent away on an assignment and never returned. At Aurien’s request, he was soon transferred to the Jedi temple on Alzoc III, a much smaller temple. 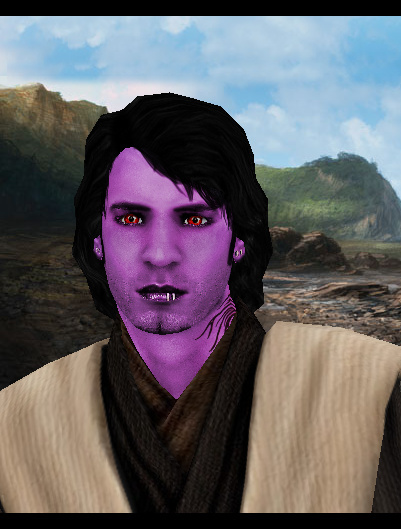 A few cycles later, Aurien met a Nelvaan Jedi Knight named Delmi N’jork- His new Master.